Are you planning an upcoming home improvement? If so, you are not alone. Higher-than-average renovation spending is expected in 2017, according to a leading consumer magazine, with more than half of homeowners planning to spend money on home improvements throughout the year. From upgrading appliances to gutting entire rooms, big projects can have a big impact on a home and on your wallet, so it’s important to approach any renovation with thoughtful intention. Knowing how long you expect to live in your home can help you better navigate home improvements. If you only plan to live in your home for five years you’ll likely make different decisions than if it is your forever home. Home upgrades don’t come cheap, so it’s helpful to determine a budget before you start. Consider renovations and upgrades as a smart way to maintain your home investment. By putting money into your home, you are helping maintain its integrity, style, usefulness, and value. When setting a budget, you can pay out of pocket or take out a personal or home equity loan. Additionally, some companies offer low-interest financing. If you plan to borrow for your project, make sure you clearly understand and are comfortable with payment terms. Once you set a budget, stick to it. Problems may arise that require unexpected additional costs, but often budget blowouts are from homeowners who start spending and the excitement of the project causes them to go beyond their means. What purchases are worth the splurge? Research and decide which purchases are worth spending more on. For example, appliances used nearly every day are a worthwhile investment — especially if they are more energy efficient and offer features that enhance your day-to-day routine. Rather than getting a basic washer, opt for the LG TWINWash(TM) 2-in-1 washer. It can run two loads at once, saving homeowners time and energy. LG TWINWash combines any Energy Star(R)-certified LG front load washer — including the largest capacity on the market (at 5.8 cu. ft., it’s large enough to fit a full set of king-size bedding and a comforter) — with a second washer, the LG SideKick(TM). 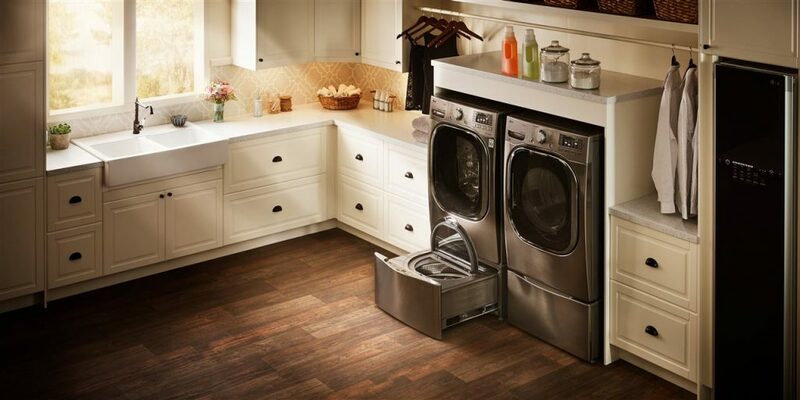 This smaller washer sits in place of the pedestal, and washes 3-4 lbs. of clothes, making it perfect for custom-care items. Owners of LG washers can also decide to upgrade their existing front load washer from 2009 on with the LG SideKick instead of purchasing a new one — making a big upgrade simple. Bottom line: Make sure your purchase improves your daily life and is proven to last. (For example, LG washers and dryers were recently named the most reliable in all laundry categories by a leading U.S. consumer products publication). The return on investment should be considered in many ways for home improvements. First, check out reputable reports like the Remodeling Cost vs. Value Report. For example, adding fiberglass attic insulation recoups 107.7 percent of the cost. In addition to resale ROI, consider other ways you’ll get a return on your investment. Will your upgrade help you save energy and reduce your bills? Will it save you time and stress in daily life? Does it enhance your home’s aesthetic and flow? These are other ROIs that are just as valuable to consider as resale ROI. It’s worth your time to conduct research so you get the best outcome possible. Learn about materials to discover which is best for your lifestyle and research brands. If you’re hiring the project out, research contractors to find a reputable professional for the job. Starting a home improvement project is exciting. Answering these questions will help ensure your time and financial investment are well spent.